7 Bonne Annee French Images – Kids & Ladies! Today, I have a gathered a fun collection of our 7+ Bonne Annee French Images – FREE to you. There are 3 cute children New Year postcards to start us off. 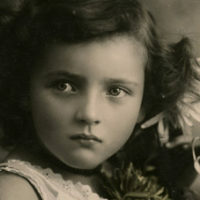 Every one of these vintage images of children is just adorable. I have adjusted one so you can add your personal greeting as well. Then we have some beautiful Bonne Annee French Women celebrating the New Year in fun ways. Their clothing is just amazing. Be sure to check it out. I think you will find they are great images to print as well as to use in your New Year Craft Projects! I think this one is just too funny!!!! This is a wonderful French Bonne Annee card. 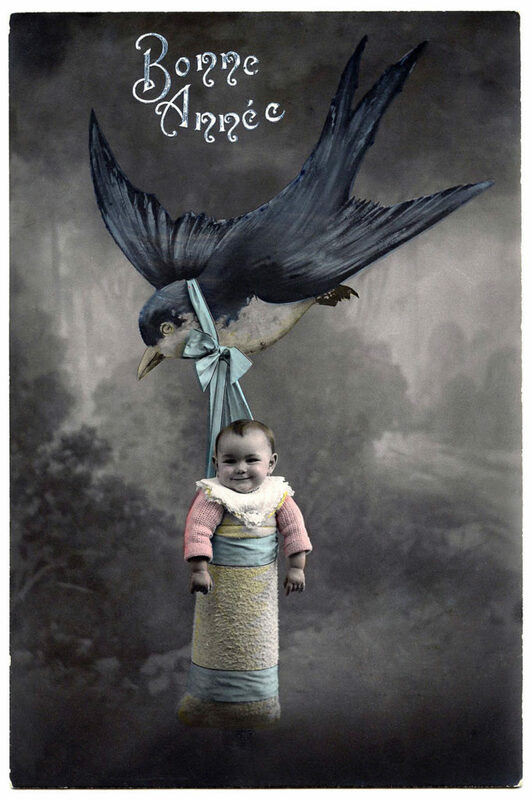 The card shows a large bird, it looks like a Swallow to me, carrying an adorable little baby! Look how happy the baby is, she really seems to be enjoying the ride! 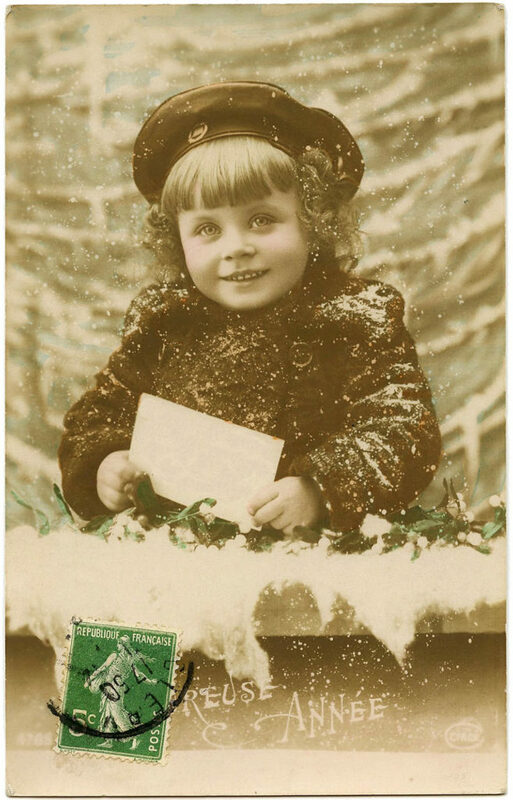 This is a cute Old French Photo showing a Darling Girl in the Snow! She’s holding a card with the greeting “Bonne Annee” on it, and there’s a lovely French Postage Stamp as well. I’ve included a second version with the card blank, so that you can write your own message on it. 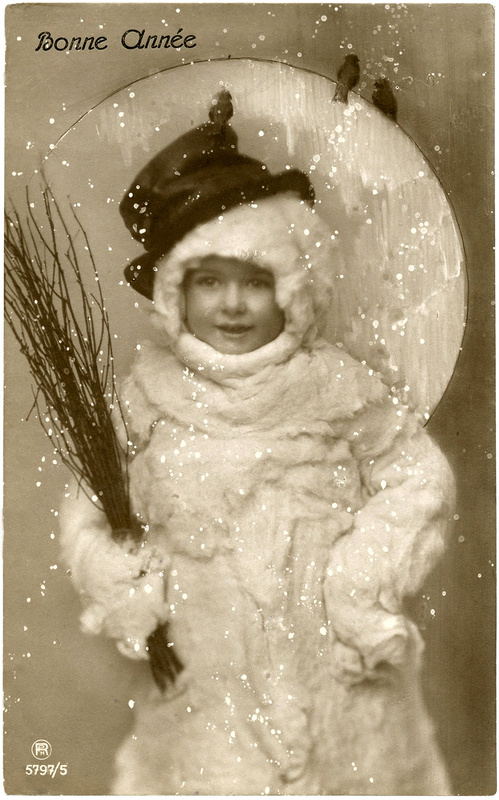 I think this Vintage Snowman Image of an adorable little Boy dressed up in a fluffy white Snowman Costume is so fun! I’ve never seen a card like this before. I think it may be quite unusual! The card is French and it has the greeting “Bonne Annee” or Happy New Year on it. 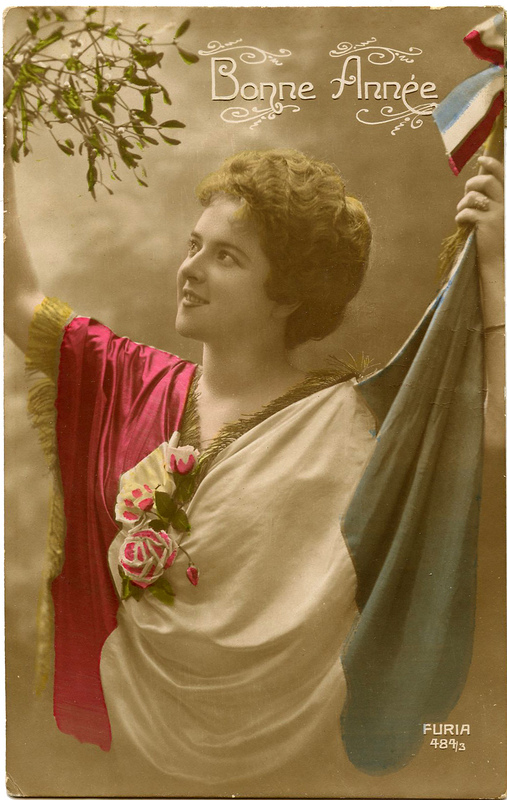 Here’s a lovely young French Woman, dressed in a French Flag for the New Year! The flag is decorated with Gold Fringe along the edges and she has some beautiful Pink and White Roses tucked into her neckline. I love the bright tinted colors on this one! There is a postmark on the back of this one, it’s difficult to read but I think it dates to either 1912 or 1915. 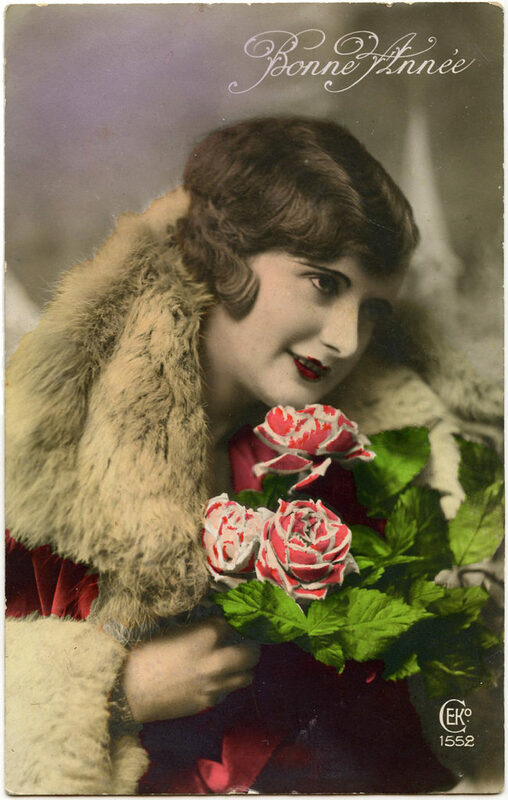 This is a very pretty tinted French postcard of a young woman holding a bouquet of pink and white striped Roses! 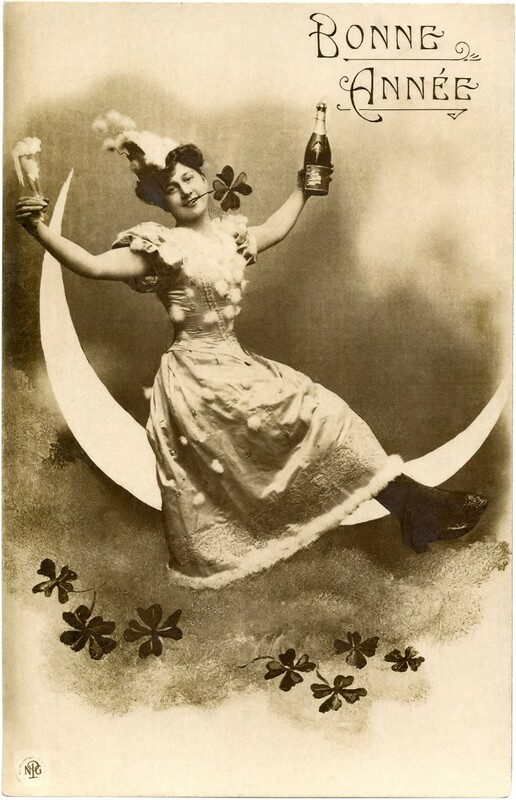 Here we have a fabulous Vintage French New Year’s Postcard of a fun loving young Woman seated on a Crescent Moon. She’s ready to ring in the New Year with her bottle of Champagne and a Shamrock for Good Luck! The greeting on the card is “Bonne Annee” or Happy New Year! I love the old time Sepia tones on this card! I hope you enjoyed this curated collection of 7+ Bonne Annee French Images. You might also like our 10 Black and White New Year Clipart Images HERE! 7 Vintage Group Photos of People! 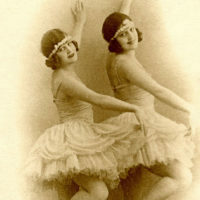 14 Ballerina Pictures – Clip Art 17 Vintage Photography Children – Sweet Girls! « Vintage Sewing Mannequin Graphic! Hi Karen, You are such a sweetheart to share these images with us. Thank you so much! I wanted to let you know I have snagged more than a few of these but never thanked you for them. Well I want to now. You are one of the seven who has been given The Kreativ Blogger Award. And you can stop by my blog any time to pick it up. Thank you for these sweet images – I so appreciate it very much! Thank you Gail, Happy New Year!